another great collaboration of the WS group--a pity not all the books could be included, but that's GL for you! NOTE: please see this post below for updated chart. and apologies to anyone overlooked! 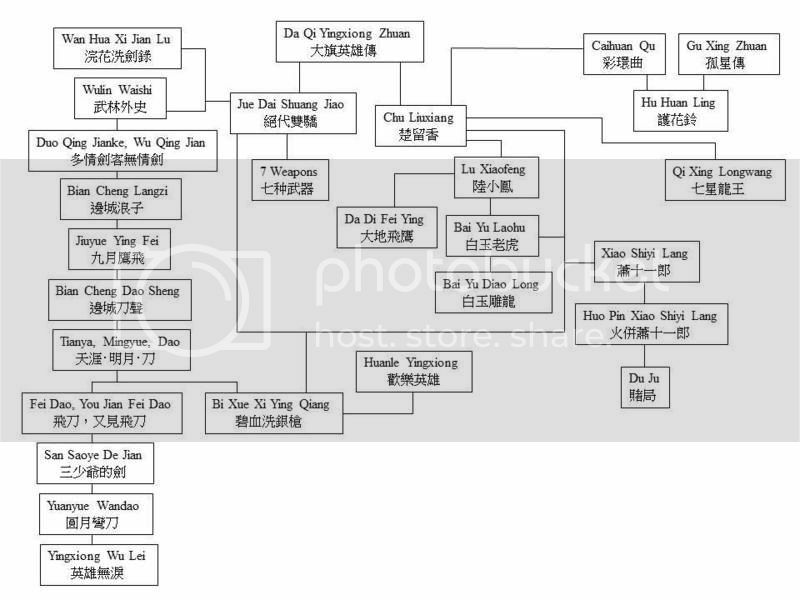 Is this Gulong Opus Chronology like a family tree? Do this mean Da Qi YingXiong Zhuan are prequel to Chor Lau Heung and Jue Dai Shuang Jiao ? So do this mean Chor Lau Heung and Siu-yu-yee ,Fa Mo-kuet from Jue Dai Shuang Jiao 絕代雙驕 are from same time or same generation ,do they meet each other in the novel? So do this mean Luk Siu Fung and Xiao Shiyi Lang are sequel to Chor Lau Heung ? Do Luk Siu Fung meet or mention Xiao Shiyi Lang in the novel? So Is Xiaoli Feidao Dagger is sequel to Bian Cheng Langzi or Bordertown ? Do this mean Luk Siu Fung ,Xiao Shiyi Lang and Fung Hang Suet from Bordertown are from same generation and same time ? you know that GL is master of vague and lord of inconsistencies. so, despite the charts, there are discrepancies that exist. however, despite that and based on (mostly minor) characters appearing in the various books or made mention in other novels, we've pieced together this rough map of which books are "older" in the timeline (vertically) and which are roughly "contemporaneous" (horizontally--although they are intentionally misaligned so that you wouldn't think they are exactly parallelled). but again, take these with a grain of salt since, with the exception of most of the books in the "dagger li" series, the rest are pretty much stand-alone/self-contained stories. [1a] DQYXZ does seem to precede CLX because it is implied that CLX is descended from TZT. [1c] CLX books and JDSJ books are separate stories, no overlaps. they are individually connected to DQYXZ, that's all. [2a] LXF is not a sequel of CLX. there is a CLX reference in one of the LXF stories, which makes it chronologically later in the timeline. [2b] LXF, CLX, X11L do not meet, know, or fight each other. they aren't the ex-boyfriends of the same crazy woman either (or anything of that sort). [2c] no, LXF, X11L, FHX are not contemporaries. WLWS's SL is ah fei's father. ah fei is friends with LXH, the protagonist of DQJKWQJ. the next 4 books deal with LXH's student, YK and his friend FHX. FDYJFD is about LXH's grandson. SSYDJ, YYWD, and YXWL make deferential references to LXH as this "great hero of the past" (plus there are other minor links/relations to some character or another in DQJKWQJ). [2a] BYLH & BYDL are duologies, as are X11L & HPX11L. [2b] the bai yu books are definitely later than LXF because the tudis of LXF and XKZX are mentioned, as is XMCX's son. no other overlaps exist, esp in relation to plot. @galvatron one further point: besides in-text references, we also assumed that the books written in his early period are also older in chronology. if you'll look at the updated GL's Opus thread, you'll find the dates of the books. so unless it is somehow indicated that a set of stories is earlier than another, the ones written earlier precede the later ones in the storyverses as well. again, the horizontal alignments are not as accurate as the vertical ones in terms of chronology. again, i want to emphasize that the connections between most of these stories are tenuous at best. majority of his stories are not meant to be read in series, and even in the dagger li universe, the links aren't as tight as they are in LYS's or JY's books that make up roughly continuous storylines (see their respective threads for details on which stories are linked). for readers who choose to read GL's books as separate, stand alone stories, that is totally fine and doesn't cause confusion (well, for the most part--it's probably adviseable to read the first dagger li story, the first CLX story, the first LXF story, for obvious reasons; but otherwise, the rest of the books "in series" can be read as independents). Cool chart. 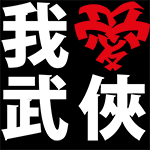 What connection does 浣花洗劍錄 have with 武林外史? And what connection do they have with 絕代雙驕? shen lang from WLWS is mentioned in JDSJ. i can't find the note that links all three--it's either a character mention or some sort of MA or weapon. Another little chronological link: In Chapter 32 of Sentimental Swordsman, Ruthless Sword Chu Liuxiang is mentioned fighting and defeating Water Mother Yinji 水母陰姬, which happens in the third book in the Chu Liuxiang series, The Thrush 畫眉鳥. So we can tell from this that Gu Long was at least through book three of that series while he was writing Sentimental Swordsman. well, we always knew GL didn't give a fig about chronology and internal consistency! looking through my notes, there're also constant references to LXF throughout the dagger li series. for those who are new to the GL universe, please remember not to take the chart too literally and seriously--it was just a fun exercise to see if it was even possible to provide some connections between the stories. the dagger li series is the most internally consistent of all the books.